When highlighting the social aspects of coffees, we sometimes have a tendency to understate the contributions of our exporting partners. We focus, quite rightly, on the hard work and commitment of the the producer and her/his family. However, often, without a strong, sustainable and supporting relationship with an exporter, these producers would never have been able to access the specialty market in the first place. And we would have never had the pleasure of enjoying the product of their hard work! 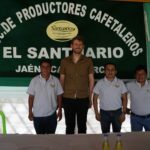 Eric Jara Dávila of Santuario Coffee is a great example of an exporter who is really working to benefit both sides of the supply chain. Currently, Mercanta works exclusively with Santuario for our Peru sourcing for the EU and North America. 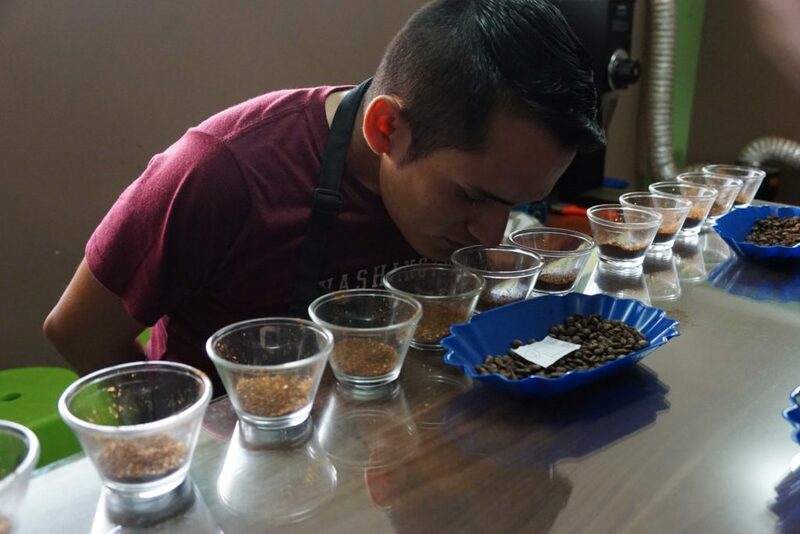 Eric has been incredibly generous with his time and has worked very hard to understand our market for quality so that he can pair us with the best producers in Peru. The Santuario Association of Coffee Producers (Asociación De Productores Cafetaleros El Santuario) was created in 2017 to help producers in the Cajamarca to improve the quality of their production and gain better prices, accordingly. The Association’s main objective and activity is to work in cooperation with small producers and producer organisations in order to promote coffee quality improvement. The business not only helps with market access, they also assume the role of agricultural extension – or technical field assistance – where individuals with agricultural expertise and training advise on all aspects of soil fertility, cultivation techniques, harvesting, post-harvest and, generally, improvement of quality. The coffee that the organisation works with comes from varied and unique production areas of the Cajamarca region. With diverse microclimates and high soil quality, they’ve identified practices that enable individual producers to instil the very best quality in their diverse lots. The focus, then, is on the production of small, distinct and unique high quality microlots…. And of course on making sure that these very special coffees find the right home with speciality roasters. 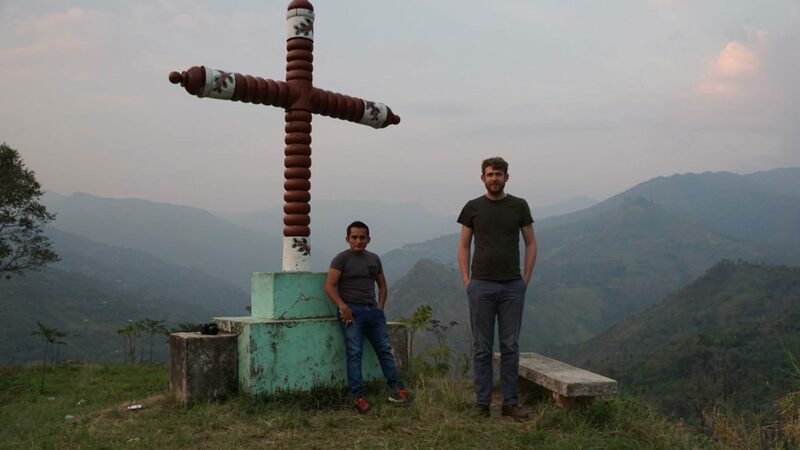 Ultimately, Santuario aims to help producers in one of Peru’s most impoverished but also promising (coffee-wise) districts to find sustainable markets for their coffee and improve their livelihoods. Mercanta is excited to be able to help them achieve this goal. I managed to catch up with Eric recently and asked him to tell us a bit more about his work and what’s next for the Association. Q: How did you get into coffee? I studied International Business at the Universidad Nacional Pedro Ruiz Gallo. It is a regional University and in high demand. The year I applied there were only 30 vacancies and there were 500 applicants. To finish your degree (before you get the actual degree), you have to complete a year-long work placement in the field that you are specialising in. For my work placement, I worked for a Canadian NGO called PROA (Progreso Agrario), which gave commercial advice and logistics help to cooperatives working with coffee, cocoa, handicrafts and panela. First, they put me in ​​panela, but after 4 months there they decided to put me to working with coffee and a couple of other things before I left. I actually didn’t want to take the role because at the time I knew absolutely nothing about coffee. I hadn’t even seen a coffee plant. I spent 6 months in the coffee office and read a lot and educated myself more about the coffee. Then, we had a group of visiting customers, and they took me with them to the countryside to visit the producers since as I speak English [I could translate]. This trip helped me develop, to learn about being an intermediary between client and producer and helped me understand the hard work that the producers do to get a good coffee from their farms. I ended up working there from October 2011 to February 2016, then I made the decision to become independent and began to reach out to producers to help them market directly and teach them everything that I had learned about improving quality. That’s why I founded Santuario. Q: Why did you decide to start Santuario? My sister gave me the idea of joining with a coffee producer she knew – who is now the president of Santuario – to found an association. I met with the man [Gonzalo Guevara, owner of El Cedro] and we made the decision to start the initiative. I travelled every day from 4 a.m. to 8 p.m on an old motorbike (in the rainy season!) all over the countryside to try and find producers who were interested in working with us. I talked to them about how to improve quality, the benefits of certifying and doing good work so that they receive a better price for quality, since the NY C price of coffee was not profitable and did not cover even production costs. I really liked what I did, especially the direct contact with the producer, getting to know their needs and how to help them grow. That motivated me to continue working despite the short hours I had to sleep. But my passion for coffee is so great that I always woke up with a desire to learn something new every day, and there is no better teacher than the producer. Santuario was founded in August 2017, starting with just 30 members. After looking to work with more producers, I wanted to start focusing on certified specialty coffees. But of course I needed to generate funds to be able to start 2018, since we had to find an office, a laboratory, pay the certifications and administrative staff…. Q: What was the hardest part about getting Santuario started? Convincing producers to join the association. Financing at the start of the coffee season for the new members, since many of them didn’t yet know much about the association and were reluctant to leave their coffee on credit (i.e. to leave it with the promise of payment in one month) – Many of them have friends or relatives who are in cooperatives or have belonged, and these people have been deceived by the cooperative leaders who offer many things and do not comply. For this reason, many have lost trust in joining groups. They will only do it if a relative or acquaintance already recommends it. Q: What is your relationship with the producers like? It is very good, because [Santuario] has instilled trust, and the day-to-day teachings we give to improve their quality has made them trust us. That work is achieved when we are transparent and democratic, humble and simple, and above all when we speak to them with the truth. Q: Why do you think producers work with you? 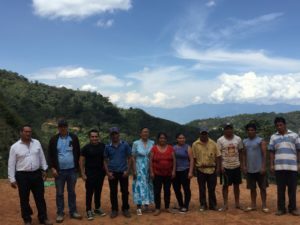 Because I visit them very frequently: training them in workshops, seeing their farms, helping them to improve both socially and in their production. They have decided that at the end of the year they evaluate how things went, [and this year] they tell me that if at any time I leave Sanctuary, take them with me! That makes me happy because I feel happy to have contributed little to improve their quality of life. Q: What kind of farmer education do you do? Workshops on fair trade, on child labour, the role of women, explanations of traceability to be transparent in terms of payment times. We also do quality improvement workshops: selective harvesting, drying, fermentation experiments, storage and tasting. Q:What are all the things you do on an average day? Meet with the producers when they deliver their coffee to know how it is, what they need and how they can be supported. Review the activities of organic certification and fair trade. Departure 4-5 am as the time of travel by motorcycle is 2-3 hours to the closest farm and 4-6 hours those that are far as Tobacco and New Trujillo. Advise producers on how they carry out their harvest and post harvest activities. Q: What are the three best things about working in the Peruvian Coffee Industry? Promote the PERU brand as one of the best producers of specialty coffee worldwide. Q: What changes are you most excited about in the next three harvests? Learning if everything taught to producers during the last months will have a positive impact and produce a coffee with better quality than the previous harvest. Q: What are the three biggest challenges the Peruvian Coffee Industry faces? Q:What are your solutions for these? Coffee Leaf Rust would require the government to invest more in supporting producers with field technicians and some products allowed by the certifiers that can control rust. In our country, the government must make everyone aware of how to care for the environment and avoid cutting down trees – rather how to cultivate more trees to have a peaceful world, breathe fresh air and so on. Q: What are your plans for the future?! To form my own specialty coffee company. I want to continue supporting the producer but in a more direct way paying better prices and teaching them new things so that they improve their quality of production and thus improve their quality of life. Q: Do you have any pets? What are their names? I have one, it’s one year old and it’s called Cody. Its a Shih Tzu.